Children's author Rick Walton has started a blog titled Why Read Aloud? He's collecting stories about reading aloud and being read aloud to. He says, "we will figure out a way to get your stories to the administrators and teachers who need to hear them. Your story of how being read to made your life better might motivate a teacher to read to her kids and make their lives better." "It is read-aloud time. The classroom is absolutely silent except for my voice and the muffled sounds of children playing on the playground that come in along with the puffs of fresh air through the open window. Some student sit with their chins propped up in a cupped hand; others lay their heads on their desks. Every student is relaxed yet alert. There is tension in the air, a simultaneous yearning for closure and for continuation. Some watch me. Others stare into space. Because they are each intently visualizing the story in their own way, the eyes of all of the students seem slightly out of focus. My eyes are the eyes of all twenty-six students as I read the book. My voice paints the story on the canvas of twenty-six imaginations. The story can pause for a question, a comment, or a short discussion to clarify or extend meaning without the spell being broken. Even when the book is closed at the end of a chapter or the end of the book, and the room erupts into cries for more or sighs of satisfaction, the magic of read-aloud is not gone. An individual connection has been forged between me and each student via the book. Just like a parent at the edge of the bed or with the child in my lap, my voice has personally delivered the story directly to each pair of ears and each imagination. The book also creates a collective connection, bonding me and all the student together as one through the common experience of having met the same characters, gone on the same journeys, and suffered the same losses and triumphs. Do you have a story about the power of read aloud, or a favorite book to read aloud to your children? Share it here, then go over and share it with Rick Walton, and then give the child on your lap or the children in your classroom the chance to "learn without trying" as you weave magic with words by reading aloud to them. In January, many people make resolutions to watch what they eat. 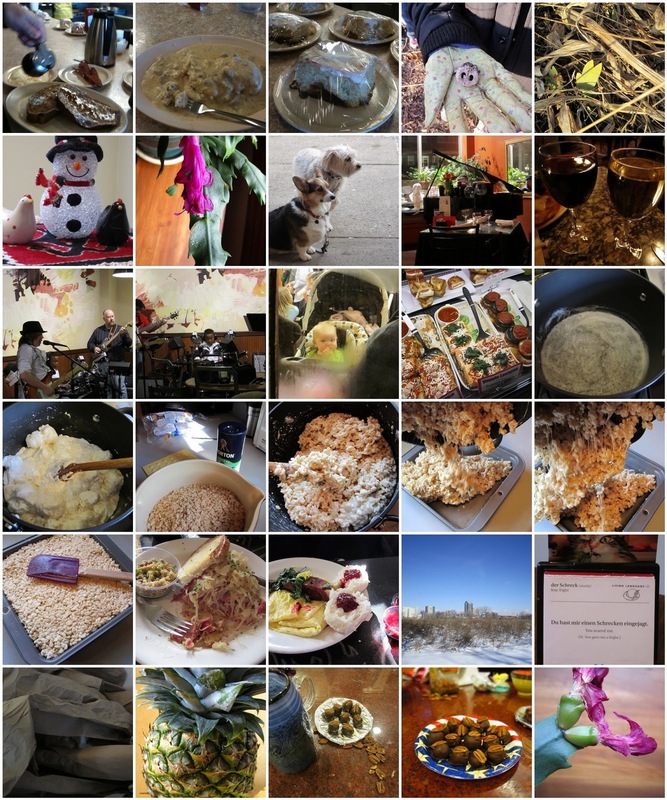 I guess you could say the same was true for me this month...more than half of my photos are of food or food events! It's got to be a good month when you end with fresh pineapple (10 for $10 at Kroger -- WOW!) and a bourbon ball-making party! Sunshine and blue skies have been quite rare this month -- that skyline shot in the next-to-last row really shines out, doesn't it? I took it from a Metro Park I never knew existed. We ate brunch at Skillet (details of the Reuben and the Omelette here) and on the way home, I asked where Whittier St. took you if you stayed on it and crossed Front Street. Come to find out, this is Columbus' newest Metro Park -- Scioto Audubon Metro Park. We'll go back in the spring with our bikes and do some exploring to find out how the bike paths there connect to Grandview, German Village, and Downtown. The Christmas Cactus has been making appearances every month since November, but I think the last, shriveled, dried bloom will be dropping off soon. On Friday afternoon, when I watered the front porch geraniums that are living on my classroom windowsill again this winter, I noticed that the crocus that made an appearance in one of the pots last February is coming up again. And so the seasons go round and round. Books are piled everywhere, clamoring to be read. 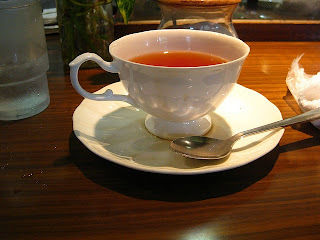 Everything can wait while we have this cup of tea together. Last spring, we took our fourth graders to a leadership camp, where they took part in all kinds of team-building activities. One activity was a giant platform teeter-totter that could hold an entire small group of students. Their goal was to arrange themselves on the platform so that it was still and balanced. The group I was with was not having an easy time with teamwork, and they attacked this challenge, as they had the others, without communication and planning. The camp counselor and I watched as the platform tipped up in one direction and they all moved to the other side of the platform, tipping it up in the other direction. Back and forth, crises after crises, no communication, no planning, no balance (but lots of squealing and bouncing and fun). Balance, to me, is NOT when the platform of my life is completely still and level. That would be impossible to achieve for more than about 5 minutes at a time. But balance is also NOT those times when the platform of my life tips back and forth wildly. What I'm trying for is a life that dips slightly on the one side when work piles up a little too much, but that also dips slightly the other way when I put all the work aside and take time for me -- for exercise, time with friends, blogging, sleeping in. The tilt has been towards the work side the past few weeks. I'm inching my way over to the "me time" side, beginning with a cup of tea, and Poetry Friday! Elaine has the roundup at Wild Rose Reader this week. I'll be putting aside my to-do list tomorrow morning to come and read the week's offerings. See you then! Our 4th graders are working on a project that integrates several pieces of the curriculum. One of the things they will be doing is making objects to sell for a charity of their choice. To go along with the items, they will pass out How-To sheets to let buyers know how they can make the items at home. 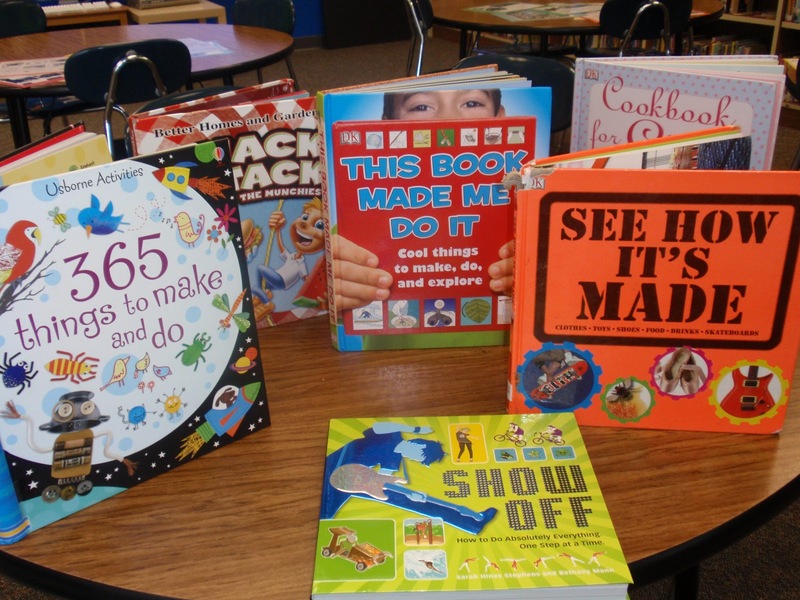 To get started with this part of the project, we began looking at How-To books as mentor texts. I like How-To writing because I think it is a genre that can teach a great deal. I find it to be a good genre for teaching sequencing, reading like a writer, using clear sentences, and determining what is/is not necessary information. Because this is a quick piece of writing, I feel like some good revision strategies can also be practiced. I find with shorter text, kids are much more willing to go in and reread and play with things. When they have written long, it is usually not so fun to go back and revise. These books are all a little bit different in terms of their layout and the things they include in each set of directions. But they all have effective how-to pieces. Kids have looked at these books before--as readers and as they were looking for ideas of things to make for this project. Today, we looked at them as writers. My first thought was to give them the actual books to look at but they are so full that I knew that would get distracting. I knew that if I really wanted them to focus on both craft of the writing and the craft of the layout, I would need to choose some great examples. So, I chose an example or two from each of the books and copied/laminated them. I gave each table a set of 8 of the same set of directions to explore and read-like-a-writer. Then, together we came up with what made good how-to writing. We then moved to talk about what made a good layout for how-to writing. The conversation was interesting and I think we all learned a lot. Although this is only one piece of the writing for this project, it will be a fun one. I am excited to take their learning to the next level once they begin writing. The Columbus Metropolitan Library did not get to be the 2010 Library of the Year for no reason! I am constantly reminded of how lucky I am to have such a resource in my city. This week, during library classes, each group was able to meet and learn from Miss Val, who runs the Homework Help Center in Dublin. Miss Val was able to meet each class, read some books and poems, and share information about the new Homework Help Center. The kids were all excited and I am sure many of our students will visit the Homework Help Center soon. Our students love knowing the librarians at the Dublin Branch. They love to see Miss Loren, Mr. George and Mr. Ray on their visits to the library. They will now know 4 people during their visits. The outreach they have done has really helped our kids get excited and feel welcome in the library. in December. And she was right! I think the Homework Help Center is a brilliant idea. Kids can go in and get help with their homework. The center is filled with tables, computers and supplies such as markers, scissors, etc. Miss Val, Miss Jeanie and the volunteers help students from grades K-12 with their homework. Having that little bit of support can make a huge difference for kids. And Miss Val helped the kids see that it was a fun place to hang out. I know as a parent, it is often easier to have someone else help with homework after school on some days. And most days, kids don't need much help--so a place like this would help them be efficient about getting it done. I also love that kids can use the resources in the library--if they are doing research, they have so many resources available to them. I also love that it gets them to library and most likely, they will start to love it there. And parents can do their own thing in the library while kids are there. It is not a babysitting service but kids can be in the Homework Help Center by themselves while parents read, browse books, etc. My big goal for the past three years as librarian at Riverside has been for my students to see the library as a hub for learning and thinking. A place full of resources and possibilities. A place where you are in charge of your own learning. The Homework Help Center and the other programs that our CML children's programs offer supports that message completely. I am excited about this opportunity for our students and our community! GABBY AND GATOR by James Burks is a great new graphic novel. It is the story of Gabby, who doesn't quite fit in. She has lots of interests and talents but the other kids don't quite understand her. And it is the story of Gator, an alligator who also has no friends. Gator and Gabby meet and hit it off right away. They understand each other and they understand what it means to be friends. The book is amusing. Gator is always hungry-trying to eat things like dogs and squirrels. In the meantime, Gabby is being bullied. Luckily Gator saves her a few times. The story is a fun one and has good messages about friendship, acceptance, bullying, etc. The reason I most like this book is that it is a graphic novel that is appropriate for young readers. I find that our youngest students love the idea of graphic novels, but so many are meant for older readers. I think the format of a graphic novel is perfect for young readers--so much of the meaning comes from the illustrations. This particular graphic novel gives kids lots to think about but is written in a way that makes it very accessible to younger children. And, because it is a graphic novel, the book will also appeal to older readers. It is a fun story and the illustrations will draw in readers of many ages. The book is a bulky book--lots of pages and a larger than usual graphic novel size. Many of the spreads have very few, if any words while other spreads contain more dialogue. The characters are well developed and the story is a good one. I am thinking this might become a series. 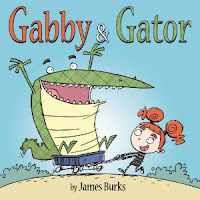 I can see Gabby and Gator going on other adventures. I am hoping that we see more graphic novels like this in the future--graphic novels that are more appropriate for younger readers, but that will still appeal to older elementary kids too. My 11-year-old daughter wrote this poem tonight, thinking about the book that is the read aloud in her classroom, OUT OF MY MIND by Sharon Draper. After a year of lots of travel and coursework, I am working hard this winter to get back into a more healthy life balance. One of those pieces that helps me feel balanced is getting back to the habit of daily reading. I have never stopped reading, but for a while there, most of my reading during the last year, was for a purpose and I lost track of what I was reading and how much I was reading. I felt like I couldn't keep up and I didn't have control of my own reading. I found myself meaning to read at bedtime but then falling asleep after just a few pages. My To-Be-Read stack grew to an overwhelming pile and I just couldn't find the time to enjoy reading when there were so many other things I had committed to. I am a much healthier, happier person when I read lots. In November, I attended ALAN at NCTE and came home with a huge box of books. Holiday break provided lots of time to read and I have a semi-calm winter season that is also giving me lots of time to read. Donalyn Miller's #bookaday challenge helped me catch up on my ever-growing pile of books. Paying attention to Twitter friends, @PaulWHankins, @Donalynbooks and @Professornana on Twitter, I realized how many books were out there that I was dying to read. And, these people read more than anyone I know. And then I learned that @MrSchuReads read over 1700 books in 2010! When you hear about so many great books on a daily basis, how could you not make time to read more? I joined the Facebook group (The Centurions of 2011) of people committed to reading 111 books in 2011.Because of the Facebook group, I have been keeping better track of my reading. I realize that I read a lot that I never really count. Keeping track of picture books is difficult but I am trying. Hopefully I can keep it up. So far this month, I have finished 36 books. I am into a better health routine this month. Eating better and exercising almost daily. Since I was pretty out of shape, I started on the stationary bike and have been reading on the Kindle. I am currently reading RUN LIKE A MOTHER on my Kindle. These authors are marathon runners, which I do not ever hope to be. But I am always interested in ways that busy women fit in healthy habits and I love this book. I am about halfway through and it is the perfect book for me as I try to regain a more balanced life again. Some highlights of my January reading that I haven't yet mentioned on the blog have been middle grade books. These, in my opinion are must reads if you are a 4th, 5th or 6th grade teacher. THE DEFENSE OF THADDEUS A. LEDBETTER by John Gosselink is a great read--probably best for 5th grade and beyond. It is the story of Thaddeus Ledbetter who has been suspended from school for the rest of the year. This is Thaddeus's story. His defense. His proof that he should not have been suspended. The book is filled with letters, emails, detention slips, etc. But the voice of Thaddeus is one that I loved early in the book. He is a good kid that has gotten in trouble. He doesn't mean harm (as he tells us many times.) As you know, I am all about good characters in my reading and I love Thaddeus. (He even has a great blog. )This is one of those books that is definitely funny but there are also serious issues to consider and discuss throughout the book. I was able to read both the first and second book in the new series, THE INCORRIGIBLE CHILDREN OF ASHTON PLACE by Maryrose Wood. I LOVE this series and cannot wait for the 3rd book to be released. (I actually read the ARC of the 2nd so the 3rd may not be coming for a while..) The story is about a governess who is hired by a family to care for 3 children. The three children were found in the woods, and were supposedly raised by wolves. The governess, Miss Penelope Lumley is by far one of my favorite characters ever and the adventures of Miss Lumley and these incorrigible children are quite fun. I can see this as a possibility for an early-in-the-year read aloud for grades 4 or 5. A book that will hold kids' attention and interest and one that will give them lots to talk about in order to set the stage for a year of great read aloud. This is a light read--no huge real life issues to think about. It is really the voice of the author that makes it such fun. How I missed this book for so long is beyond me. Betsy Bird let us know how great it was in May. I would love to meet this author. She has to be totally hysterical. This series is a definite MUST-READ. Poetry Friday -- SNOW DAY!! There's no such thing as too much snow if you're a teacher buried in an avalanche of grading, planning, and data to be analyzed so you can better plan and design assessments to be graded and analyzed and used to inform further instruction. And, yes, someone wished for this snow. A whole lot of someones, in fact, both shorter and taller. It's nice when, every now and then, wishes do come true! Happy Snow Day! Check out the Poetry Friday roundup at A Teaching Life, hosted by Tara. On Tuesday, I introduced my fourth graders to compound sentences. First, we brainstormed nouns and verbs and wrote simple sentences. Then, together, we connected two simple sentences with a conjunction (one of the FANBOYS -- for, and, nor, but, or, yet, so). They all gave it a try with two or three sentences on their own. Tuesday afternoon, in reading workshop, a student came up to me with DIARY OF A WIMPY KID: THE UGLY TRUTH in hand and pointed out a compound sentence in the book. Yesterday, Wednesday, we started writing workshop by singing the School House Rock classic "Conjunction Junction." Then I challenged them to write at least one compound sentence for their SpellingCity sentences. (SpellingCity is another post for another day.) Eight out of eighteen who finished sentences wrote at least one compound sentence with some kind of success. Two of the eighteen (the one who sighted compounds in Wimpy Kid, and another very capable writer) wrote exclusively in compound sentences. Every student in my classroom has a new tool in their writer's toolbox: compound sentences. Some aren't ready to use this tool (and might never be). They are still struggling to put words together into simple sentences and sentences together in paragraphs that make sense. Some will overuse this tool with partial understanding and create run-on sentences with a conjunction in the middle, causing more problems than it might have been worth. The thrill in making this tool available to my writers was watching those two who were really ready to try something new in their writing reach out for it and put it right to work, gleefully creating sentences that were more and better than any they'd ever written. I had forgotten how much I LOVE fairy tales--especially great retellings. I learned about PRINCESS OF THE MIDNIGHT BALL from Melina at Reading Vacation. It sounded good so I picked it up. I read it quickly and LOVED IT. I love Jessica Day George. I have read Dragon Slippers and I have other authors whose fairy tale retellings I read (Gail Carson Levine and Shannon Hale) but I hadn't realized that Jessica Day George had books for older readers. This book is George's version of The Twelve Dancing Princesses. I don't know that story well but I do remember having a Golden Book version of it when I was younger. Jessica Day George tells this story in a way that makes sense and stays true to the original version. This is the story of Galen, a soldier, who has become the king's gardener. And it is the story of the 12 princesses who are cursed to dance every night from midnight until dawn. As you can imagine if you know good fairy tales, Galen falls a bit in love with the oldest princess, Rose and wants to free them from this curse. For me, a book is always about the characters and Jessica Day George does an amazing job at creating characters that are real and believable. And I love these modern retellings because the princesses are always much stronger than they appeared in my childhood versions. This is one of those Young Adult books that would be a good read for advanced 4th or 5th graders. I have been looking for books for more advanced 4th or 5th graders lately and it is sometimes difficult due to the content of some YA. I just ordered the sequel to this book PRINCESS OF GLASS which I am excited to read! I have always loved Esme Codell's work. I was thrilled to read on her blog last week that she had a new book coming out and couldn't wait to share it with kids. I knew that it would be a hit. Well, this book, FAIRLY FAIRY TALES definitely makes it to my BOOKS I COULD READ A MILLION TIMES list. I have been trying to figure out what it is that makes a book one that I could read to children a million times. This book helped me solidify that a bit. One thing that makes reading aloud to kids so fun is the looks on their faces as I read. There is really nothing like it. 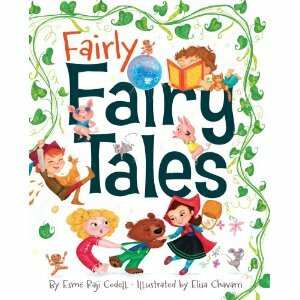 And when I read FAIRLY FAIRY TALES aloud this week, the look on every child's face was pure joy. The sound effects (mostly squealing and laughing) were also joyful as they listened. It was a happy, loud day in the library. The book is such a great one for young children. Right away, the kids recognize so many characters they love on the front cover. Many predict that this will be a "Once Upon a Time" story (and they are right). They are excited to dig right in from the very start. I loved Esme's story of how she came up with the idea for this book. 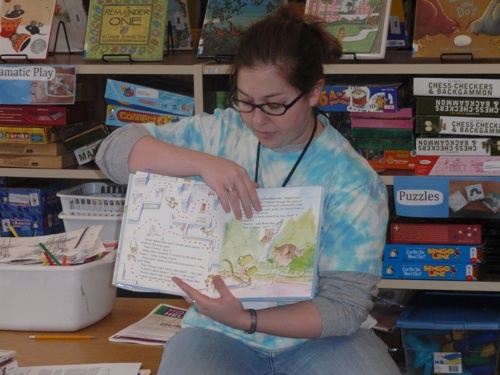 Knowing how young children respond to books is key to writing a good one. And Esme understands children and reading so well. The story begins with a young child at bedtime....not really wanting to go to bed yet. The stories that follow are all from familiar fairy tales. Each page includes simple text describing 4 things that are part of a story. Well, actually there are 3 things that are part of the story and one that doesn't belong. (This reminded me a bit of Sesame Street's "One of These Things is Not Like The Other" song/game from long ago.) When we turn the page, we find an illustration of how that 4th item could be incorporated into the fairy tale to change it just a bit. With very simple and predictable text, Esme gives us a brilliant book that has so many layers. Really, the looks on the kids faces as they recognized the thing that didn't belong, the looks when they anticipated the surprise, and the delight at seeing the new version of the fairy tale were all quite fun. This is a great book for so many reasons. First of all, it's pure fun. The element of surprise is wonderful for readers of all ages. The pattern of the language, the simple text and the picture support make it great for young readers. (The illustrations are a PERFECT match to the writing if I haven't mentioned that.) Kids can jump in and read the book on their own after hearing it read to them. The book also served as an invitation for some kids to play with the idea that Esme plays with--adding new elements to favorite stories. After reading this story aloud, a few kids chose to create their own set of items from a story they loved. For example, one child created a page with a leprechaun, a pot of gold, a rainbow and..... a puppy. She went on to tell me how a puppy could fit into the leprechaun finding his pot of gold at the end of the rainbow. If hope is, indeed, the thing with feathers, what do winter bird blobs represent? Are they hope, amassed, ready to serve where they are most needed? Or are they all the bits and pieces of lost hope, destined to swirl in synchronous flight, breaking apart, coming together, landing on lines, swarming on crabapple trees, pooping on cars, and frightening the ornithophobic? Or are they just a blob of starlings on the soccer field at my school? EDITED TO ADD (thanks, Blythe): Ultimate bird blob video -- you MUST watch this! Laura Salas has the roundup today at Writing the World for Kids. Main idea: Both of the "biggies" (Newbery/Caldecott) were COMPLETELY off my radar: never saw them, never heard about them. However, I did pretty well with honor books and the smaller awards. Disclaimer: To slightly shorten this gargantuan post, I left out the awards that didn't contain any books I read this year. No offense intended by omission. All the awards are listed here. “The True Meaning of Smekday,” written by Adam Rex and narrated by Bahni Turpin. 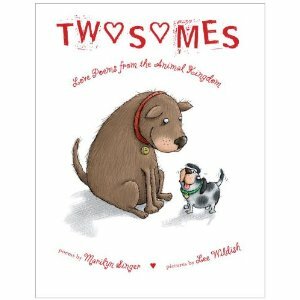 If you are looking for a fun book for Valentine's Day or something unique to add to your poetry collection, you may want to take a look at TWOSOMES: LOVE POEMS FROM THE ANIMAL KINGDOM by Marilyn Singer and illustrated by Lee Wildish. that I dig you and you dig me. I think this would be a fun little Valentine's Day gift for young children. I also think it is a fun addition to any collection. Really, kids are going to love this all year round, I think! I continue to look for nonfiction books that are interesting to students and that can be read cover to cover. I have watched over the years and have noticed that our students are great skimmers and scanners but often don't get beyond the skimming and scanning. This is true when reading nonfiction books as well as websites. As web reading becomes even more important for our students, they need experience reading nonfiction beyond skimming. When I stopped looking for nonfiction that matched the curriculum years ago, I was pleasantly surprised at how many great and interesting nonfiction books there are for kids. This weekend, I picked up three at Cover to Cover and I love them all. 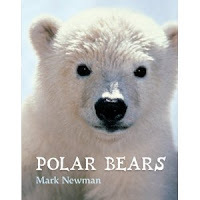 POLAR BEARS by Mark Newman is filled with great photos of polar bears. 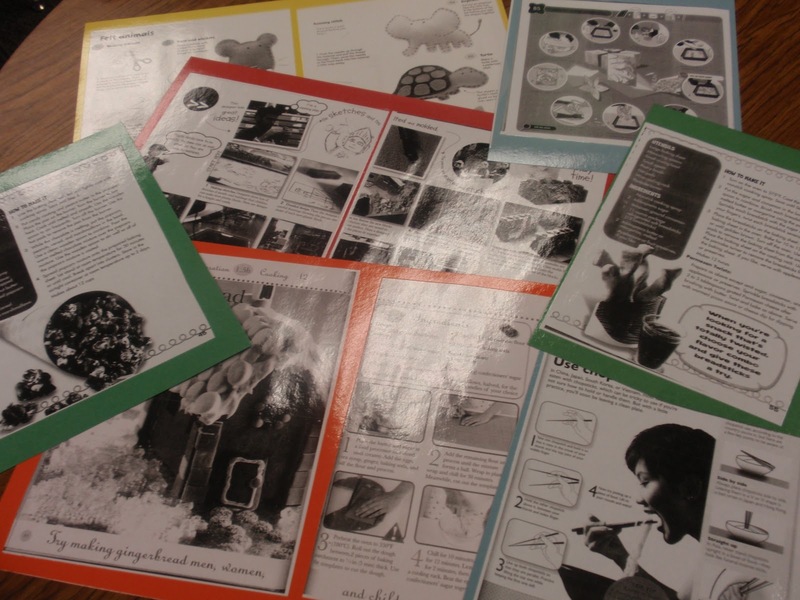 Each two-page spread focuses on one statement about polar bears. For instance, "Polar bears are patient." Following the bold print with the focus statement, a paragraph goes into more detail about this fact. Readers learn a lot about the polar bear and the length of text on each page is perfect for elementary students. This book seems like it would be a great read aloud for younger students. The pages can be read in order or based on interest. Older students should be able to read this one on their own. 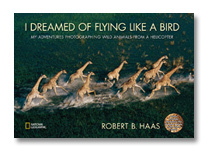 I DREAMED OF FLYING LIKE A BIRD by Robert B. Haas is a fascinating read. Robert Haas is an animal photograph but he takes his photos from the air. The book's introduction shares the way that he takes photos and then he goes on to tell stories (with accompanying photos) of several of his adventures. The amount of text on each page is very accessible and the accompanying photos pull readers in. The writing of each adventure is told as a story--as it happened so it keeps readers interested in how things will turn out. I think books are fascinating reads but also help kids see what is possible when they are passionate about something. All of the author's proceeds go to The Humane Society. KAKAPO RESCUE: SAVING THE WORLD'S STRANGEST PARROT by Sy Montgomery and Nic Bishop is my new favorite in this Scientists in the Field series. I was thrilled to see that Nic Bishop was part of this book as I love all of his work. I knew nothing about the Kakapo until I read this book. 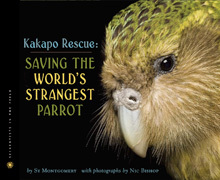 This unique parrot is one of the most endangered species in the world, with only 91 living Kakapo at the time this book was written. This book is a fascinating look at the island where scientists are working to rebuild the Kakapo population. The island and its scientists are dedicated to this one cause. The book shares the work done by the scientists and also shares interesting information about the Kakapo, New Zealand, and endangered animals in general. This would make a great read aloud for upper elementary students. I can't say enough about how much I love this series--it really allows readers to see the work of scientists in so many capacities. Today is the finish line for a year of work for the readers on the Newbery and Caldecott committees. The NCTE Notable Children's Books in the Language Arts committee is starting the final sprint towards our finish line in mid-February. We have 65 books for grades K-8 on our "top shelf" right now, and we've received +/- 250 nominees since the beginning of October that need to be read and evaluated. 6. meet generally accepted criteria of quality for the genre in which they are written. ...rather than Newbery criteria and Caldecott illustrations. But that doesn't mean I won't be anxiously awaiting today's news!! I had a little bit of oral surgery during our week off. I'm in awe of the surgeon's skill, efficiency and "chairside" manner. He knew exactly what to do and didn't waste a minute getting right down to his work. He documented every step with photos so that he would leave nothing to memory or guesswork. He told me what to expect in the week after surgery. My family dentist forwarded the pictures (I'll spare you) and the surgeon's report, which included phrases like, "pedunculated gingival lesion in the interproximal papilla." The surgeon never used language like that when he was talking to me. What does all of this have to do with teaching 4th grade? Just that if my oral surgeon could watch me at work in my classroom, I hope that he would be equally impressed with my skill, efficiency, and "deskside" manner. I hope he would appreciate the variety of ways I document my teaching and student learning. I, too, use photos, along with voice memos, video, charts on clipboards, sticky notes, and anchor charts on the SmartBoard and chart paper. My gum is healing nicely -- the last of the stitches fell out yesterday. And now I need to go grade some papers and craft some lesson plans for the week ahead. and reach, stretch and yearn...for what? Spring, of course. What else? Irene has the roundup today at Live. Love. Explore! There are so many great books from 2010, that I can't possibly choose the one book I hope to win the Caldecott and Newbery medals. This is a list of books I've loved that seem like contenders. I'd be happy if any of these books won an award. They are all deserving. There are others too but these are the ones that come to mind first. 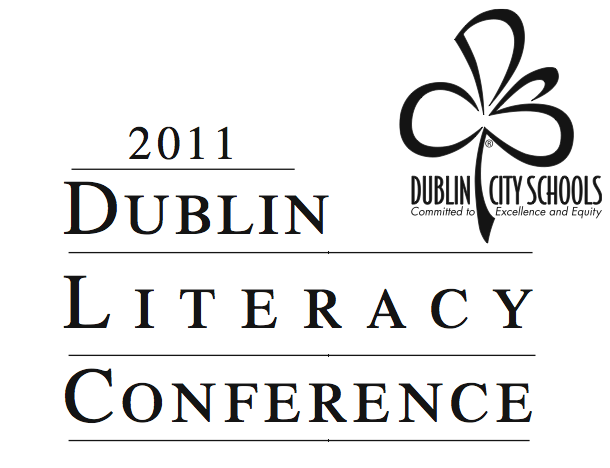 This year, the Dublin Literacy Conference will be held on Saturday, February 25. It looks to be another great year and we are both so excited about our speakers. We typically host 4 featured professional authors and 4 featured children's authors. This year, the following speakers are part of our conference. If you want to see more details, the printable program with registration information is on our district website. 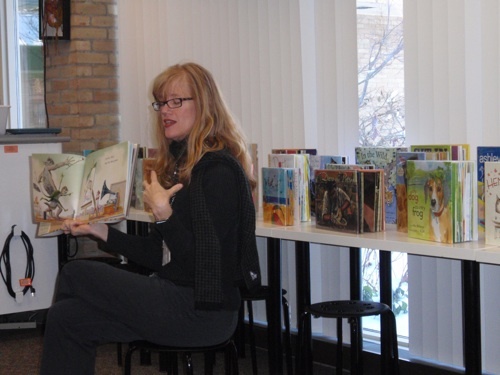 Kelly Gallagher, author of READICIDE, DEEPER READING, TEACHING ADOLESCENT WRITERS and others. Kelly will be our morning keynote. If you'd like to know more about his work, you can read a recent interview we did with him here. Patrick Allen, author of CONFERRING: THE KEYSTONE OF THE READING WORKSHOP and PUT THINKING TO THE TEST will be another of our featured speakers. Patrick also has an amazing blog about his teaching and learning life. Troy Hicks' work focuses on the Digital Writing Workshop. His books (THE DIGITAL WRITING WORKSHOP and BECAUSE DIGITAL WRITING MATTERS) , blog posts, presentations and tweets have helped so many of us move forward in our thinking about this issue. Christian Long is another speaker who has great insights into 21st Century Learning. His company Be Playful Designs focuses on school design and innovative environments.. He is a school planner, technology expert, and advocate for innovative communities and educators. Brian Pinkney is our afternoon keynote speaker. His work includes so many powerful titles. His newest book, written by Andrea Davis Pinkney is SIT-IN: HOW FOUR FRIENDS STOOD UP BY SITTING DOWN. Loren Long is an Ohio author and illustrator that we love. We first met him when he visited Columbus on the TRUCKTOWN tour with Jon Scieszka. We have since fallen in love with OTIS, DRUMMER BOY and most recently, President Obama's picture book OF THEE I SING. Amy Krouse Rosenthal's work has been an inspiration to so many of us, especially her BECKONING THE LOVELY project. (If you have not watched the video, you must do it right now!). Her newest book is THE WONDER BOOK. Others include LITTLE HOOT, DUCK RABBIT, COOKIES: BITE SIZE LIFE LESSONS and BEDTIME FOR MOMMY. 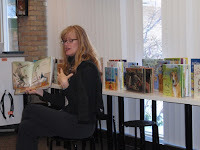 Wendy Mass is another children's author that will be part of our conference. Her newest book CANDYMAKERS is quite fun and popular with middle grade/middle school children. As are all of her books. Those of you that read this blog may remember when I wanted to start a Wendy Mass fan club after reading JEREMY FINK AND THE MEANING OF LIFE. On top of our amazing list of featured speakers, we run about 20+ concurrent sessions two times during the conference. 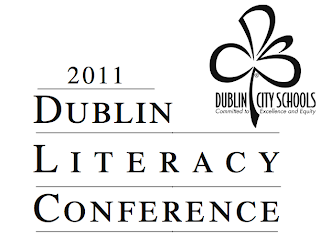 These sessions are put on by Dublin teachers as well as others who submit proposals. If you are blog readers, you will recognize lots of people from our local bloggers' group on the program. Cathy Mere (REFLECT AND REFINE) and Katie DiCesare (CREATIVE LITERACY) will be talking about "Picture Book Possibilities: Using Literature to Collaborate with Learners. Mary Lee Hahn will share ideas for "Promoting Reading Engagement In and Out of School"
Scott Sibberson (SCOTT SIBBERSON) will present on "Web 2.0 Tools for Teachers". Mandy Robek (ENJOY AND EMBRACE LEARNING) session is titled, "Something Old, Something New"
Julie Johnson (RAISING READERS AND WRITERS) and colleagues will present "Count on Communication: Weaving Writing and Conversation into Your Math Class". Maria Caplan (TEACHING IN THE 21st CENTURY) will be presenting with her school's Technology Specialist on "Integrating iPods and Technology into Your Classroom". Bill Prosser and Karen Terlecky (LITERATE LIVES) "The Best and the Brightest Books of 2010". Tony Keefer (ATYCHIPHOBIA) "Crafting Digital Picture Books". and I will be talking about "How Can Technology Tools Impact the Reading Workshop". Add these to the amazing Dublin teachers who are sharing their learning, how can it not be an amazing day of learning. I wish I could hear everybody! On top of the great speakers, they'll be lots of great books for sale, time for lunch and chatting with colleagues, a Technology Playground and student work on display. What a great way to spend a Saturday. It is one of our favorite days of the year! We hope you can join us. #7 They Called Themselves the K.K.K. Grim, but important in understanding Reconstruction, Jim Crow, the Civil Rights Movement, and where our country is today in terms of race relations. This book was a welcome relief after a string of tough reads. The characters and the setting come to life in this debut novel. It's cheating only a little to count this one as #bookaday -- it was an adult audiobook that I finished listening to on day 9, but I didn't read the whole thing on day 9. This is the second book in the first adult mystery series I've ever loved. Great strong medieval woman main character. Add Noonie to your list of favorite spunky girl characters -- she's right up there with Clementine and Frankly Frannie, and Gooney Bird Green. She's an aspiring artist, and it's her art that helps her make it through some tough times. Maybe this book won't "revolutionize" how I teach vocabulary, but I sure did get some good ideas that I'm going to try out immediately. Great collection of quotes, poems, songs, folktales, and fables from around the world on 12 different themes that all illustrate that any person can, in lots of small ways, make a difference in the world. 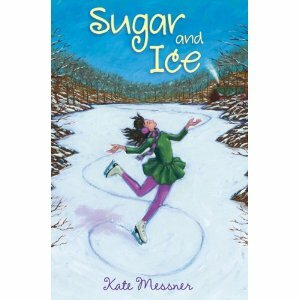 SUGAR AND ICE (An Amazon Best Book of the Month) is the story of Claire, a skater from a small town who is chosen to train at Lake Placid. She accepts the scholarship and begins training. Claire is a good skater and does well but the training means that she has less time to do other things she loves--spending time with family, hanging out with good friends, skating on the pond, working with younger skaters, etc. She also has to learn to deal with the pressure of the training. Although many of the other skaters become friends of Claire's, she has to learn to deal with the mean girls in the group--the girls who are threatened by her success. In the end, Claire has to decide what it is that she wants and how to fulfill her dream as a skater. This book would provide for great conversations. So many kids today have talents and opportunities and many give up some things they love to pursue others. I've taught grades 3-5 for most of my career and it seems that this is the age where kids either become more committed to a passion they have or they become burnt out. It is an important age for deciding what is important. Kate Messner understands this well and captures the struggle of a child in this type of situation well. The characters are great (a requirement for any book I love). Very believable characters with real gifts and real problems. I am trying to decide whether Claire's coach belongs on our 100+ Cool Teachers in Children's Literature list. My gut is that he does. He takes kids with a natural talent and passion and helps them move forward. He is intense and isn't always about the whole person, but there is something about the way he watches and listens and knows where to go next with a skater that makes me think he belongs. He builds a confidence by helping skaters at what they need individually. I need someone else's opinion first, though! Love this book and I think it would be a great book club book. It provides so much to talk about when it comes to following dreams, giving up one thing to make time for another, things worth working for, etc. I think kids would naturally find so many issues that they deal with on a daily basis in this book. This is definitely a perfect middle grade book. This is the second book I have read by Kate Messner (Marty McGuire was the first) and I am anxious to read more. I have THE BRILLIANT FALL OF GIANNA Z. on my TBR stack and am also anxious to read her upcoming professional book on revision being published by Stenhouse. And she is a middle school language arts teacher! (Yes, I know, I too am wondering how she does it all...)I so love when I discover a new author I love who has lots of upcoming books! Really, what could be better? A Year of Reading is FIVE YEARS OLD today! We thought we'd share a few sets of "fives" with you to celebrate this half-decade landmark! TOP 5 (ish) POSTS FROM 2010! Who did we interview for A Year of Reading's first author interview? From which blogger did we get the idea for 100 Cool Teachers in Children's Literature? When did we expand our social network from just blogging to blogging AND Twitter? In which year did we have the most blog posts? ANSWER: In 2007, we had 423 blog posts! A record for us since we average in the high 300s. Our highest month was January 2007 with 55 posts! How many Poetry Friday posts are on A Year of Reading? 2-Chris Lehmann's blogs and online talks have kept me grounded in my beliefs about students and learning. 3-I was lucky enough to hear Adora Svitak and Zoe Sprankle at BLC 10. Take some time to watch their TED Talks when you can. Very inspiring speakers. 4-Bud the Teacher continues to connect technology to solid learning theory and I continue to learn so much from his work. 5-Buffy Hamilton (@bufffyjhamilton) shares her brilliant thinking on blog and via Twitter. Her work has helped me to create a vision for our library. 1-Amy LV inspires me every day with her amazing year-long poem-a-day project! 2-Brenda Power inspires me with her fabulous weekly essays on Choice Literacy and her incredible generosity! 3-Audible.com inspires me to keep up with my adult reading! 4-Diigo and Delicious inspire me to keep track of my links! 5-Foodspotting inspires me to share the joy of good food! One of the things we love most about blogging is that we find new blogs to learn from every day. We have discovered many new blogs this year. Here are just a few (5 :-) new blogs we began following in 2010.